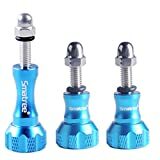 Smatree thumbscrews for GoPro Hero are a high quality aluminum and steel replacement for your original plastic thumbscrews. It is more solid and can protect your camera better than the plastic one. They come in five kinds of different colors;blue,yellow,green,purple,pink – so they offer you the colorful visual effect and add an amazing style to your camera. Sturdy and high quality is their potential. The screws are easy to tighten and remove. We’ve included a rubber O-ring which will help to prevent camera from abrasion yet not essential for every buyer. If you prefer to use the screws without the o-ring, simply remove the acorn nut and roll the o-ring off of the screw. There are eight stress surface uniform stress to tighten and it is in an anti-skid design. The long thumbscrew in the pack is for connecting the camera;short screws are for connecting camera accessory. If for any reason you are unhappy with any product by Smatree, please do not hesitate to contact us. We will do our very best to solve your problem quickly and efficiently! This entry was posted in Discount Photography and tagged 3pcs, Aluminum, Blue, GoPro, Hero5/4/3/3+/2/1, Knob, Long, Short, Smatree, Thumbscrew/Thumb by Ball Photo. Bookmark the permalink.